The furniture in your child’s room changes so much as he grows. You won’t likely have him going through school with a changing table or crib, for example. You may find that the toy box will change into a bookcase or organizational unit of some kind. In order for your child to nurture his creativity or for her to develop her education, there’s a good chance at some point, you’ll want to buy them a desk. Having a desk in your child’s room will help him or her make their room theirs by giving them a space to do their work. And should the time come for them to get a laptop of their own, they’ll be one step ahead by already having a place to keep it. There are so many options, though, that you may be lost on where to start. Don’t worry though! We’ve done the leg work for you. We reviewed dozens of kids’ desks to identify the best of the best. We looked at desks suited for teens and toddlers – and every age in between. We compared wood and plastic desks and found desks with hutches and those with inclines. No matter what your child’s age or interests, we’ve found the right desk for him or her. For the most versatile desk for your child, loko no further than the VIVO Height Adjustable Children’s Desk and Chair Set. Early on in our research, we could tell that the VIVO Height Adjustable Children’s Desk and Chair Set would be our top pick. It will grow with your child and the desktop itself inclines making it all the more versatile in its use. The VIVO Height Adjustable Children’s Desk and Chair Set is made to grow with your kids. The chair and desk each raise in small increments so that there will never be an “in between” time period for her. In fact, the adjustments are color coded so that you’ll better be able to tell what height adjustment for one should coincide with your child’s height. This will ensure she always has a seat that will encourage good posture and keep her comfortable. You simply pull up on the desk and chair for it to latch into place at each increment and to size back down for your smaller children, just pull it all the way up and push all the way back down. The increments are only 0.8″ and desk raises from 21.3 to 30 inches in height while the chair rises from 12.6 to 17.3 inches. The desktop inclines up to 40 degrees, making it perfect for her drawing or her writing, or you can keep if flat, should you want her to keep her computer on it. For each adjustment, whether it be the height or the incline, the desktop has a comfortable handle on either side, making it a piece of cake to fit to your little one and her choice of activity. There is a slide out drawer to make organization for your child all the easier and she’ll really appreciate the privacy of the storage. With right around 300 customer reviews on Amazon, this children’s desk has earned a 4.6 star rating; which is certainly nothing to scoff at! This desk is sure to be with your kid for years to come. For a classic desk that will meet all your little one’s needs, check out the Lipper International Child’s Chalkboard Desk and Chair. The Lipper International Child’s Chalkboard Desk and Chair is perfect for your elementary or preschool aged child. While learning their letters and words, spelling and basic math, the best teaching tool is repetition. Unfortunately, you would waste an awful lot of paper should you opt to print out worksheets or let him practice on any kind of scratch paper. This desktop easily fixes that problem, though, by creating a chalkboard for him to write his numbers and letters over and over and just wipe clean. The desktop lifts up to reveal storage for your little one’s masterpieces or his study materials. It pulls up away from the seat revealing this little storage box that is perfect for chalk and erasers, books or artwork. The desktop has two grooves to rest your chalk on without worrying about it rolling off the surface and the storage provides a gap for lifting that will keep your little one’s fingers from getting pinched while closing. This desk has earned an overall rating of 4.2 stars on Amazon with over 450 customer reviews. And, depending on your finish choice, it is as low as around $65! All of these facts should certainly ease your mind on the quality of the product and on whether or not you (and your child) will be satisfied. The Delta Children Chair Desk With Storage Bin will satisfy all your little one’s needs without breaking your bank. The Delta Children Chair Desk With Storage Bin has a flat and level surface so you won’t need to worry about books, papers or even puzzles sliding off the surface. It is made with a scratch resistant finish to protect the character theme of your choice (you have 10 from which to pick) and is constructed with engineered wood. The durable nature of the construction means that this desk will hold children up to 50 pounds with no concern. There is a removable cup that will let your child store her pencils or markers and removing it is no problem, should you want to clean it from time to time. (And we all know you will need to.) There is a fabric storage bin under the seat that pulls out to store her supplies and would be perfect for coloring books or board books. We especially like the idea of your little one using his puzzles or activity books here to get him used to the idea of a desk before he even goes to school. There are nearly 2,500 customer reviews on Amazon for this desk, earning it an impressive 4.4 stars. It also meets or exceeds all safety standards set by the CPSC. And let’s not overlook our favorite part of this desk: It’s only around $30-$40! You’ll get plenty of value for not a lot of money. The Step2 Deluxe Art Master Kids Desk will have all you need in a set that will keep your little artist happy for hours. The Step2 Deluxe Art Master Kids Desk is a sensational artist’s desk that will give your little one plenty to occupy him. There is a push-button light along the top of the hutch that will give him enough light to work, even if the desk is located in a less than ideal lighting area. There are dips and cubbies everywhere you look on this desk. Each side of the desk’s legs have storage that are perfect for larger supplies or books (Particularly coloring or activity books and canvases). There are so many molded compartments, you’ll have a space for any art supply he could need! There is devoted space for scissors, markers, paints and a cup holder that’s perfect for pencils or crayons. Even the dry erase desktop lifts on hinges to reveal even more storage; perfect for completed works of art or maybe, if it’s flat and you’re careful, an ideal place to put a drying painting. The included chair is made to match and light enough for your little one to move and scoot himself into the desk. With 4.6 stars and over 1,000 customer reviews on Amazon, you can be confident you’ll be as pleased as you could be with this purchase. If you have a little artist, then this is a must-have item for him! A great buy for school-aged kids who need a space to study. The Sauder Pogo Desk for Children is a wonderful desk for your child who needs a place to study. It skirts the line between little and big kid beautifully by giving a “real” desk a bin that’s perfect for a few of his most important toys. It has a flat surface and a easy-glide drawer for doing homework and storing writing utensils, respectively. The label under the drawer and above the bin will allow him the creativity to name the bin, the desk or just brand it his own. We think this is sure to go over sensationally, no matter what his age. At 62 pounds, it’s certainly heavy enough your child won’t be able to throw it around but yet still light enough for you to move, should you need to relocate or find something behind it. And that will make this all the more long-lasting; the size will likely be suitable for your child all through high school and maybe into a tiny apartment in college. Assembly is easy and you’ll only need a screwdriver and hammer, along with a provided key wrench. 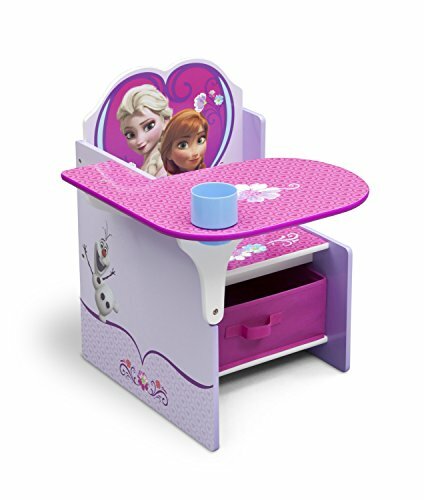 With 260 customer reviews and an overall rating of 4.2 on Amazon, there’s every possibility this desk will fit your children and their needs perfectly for years to come. You may not think so, but the truth is, if you need a desk in your life, there’s a high likelihood that your child will. And even if you don’t, your child will still probably benefit from one. From an early age, toddlers will pick up a desire to color and draw, and a desk that makes it easy for him to do so will only help foster his creativity. 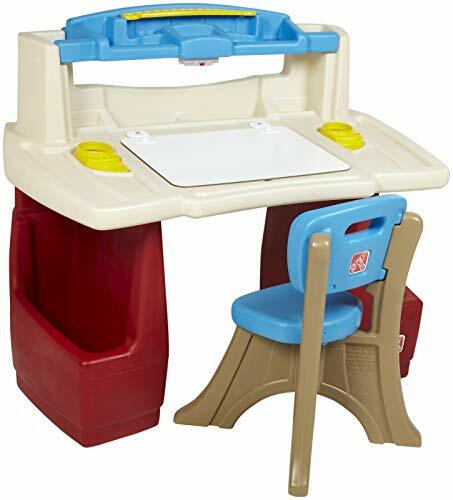 Buying a toddler specific desk will likely provide him ample organization to keep his art supplies and a space where you won’t stress a stray marker line as badly as should it happen on your kitchen table. Once your child ages out of coloring books, they may want a desk that will help them develop their art; an inclining desk perhaps. Even without any propensity for art, though, throughout her education the need for a desk will likely be nightly. Homework can be difficult and one of the best ways to minimize your child’s stress doing it is to provide her a distraction-free area to do it. A desk to study at will help her associate her time there as one to learn. Creating a place that is for a specific purpose can help a person thrive at that one task whenever they are there. Spatial awareness is a studying trick that will help her focus on the material as soon as she sits down to her desk. She may find it easier to retain certain information on a subconscious level because that’s just what she does there. And if you ask us, any shortcut possibility for our children in their education is worth it! Height. Obviously your child’s height will impact the height you want for the desk you get her. You should pick a desk your child can sit at and his feet touch the floor. If you’re wanting a desk that will age with him, there are a couple options, still. You can pick up a desk that adjusts to your child’s size (though those are a bit more difficult to find, they do exist.) Or you can buy a larger desk and pop a foot stool underneath it so his feet aren’t swinging uncomfortably. This will help maintain proper blood flow because, as we know, a child who’s not comfortable won’t stay in a place long. Durability. 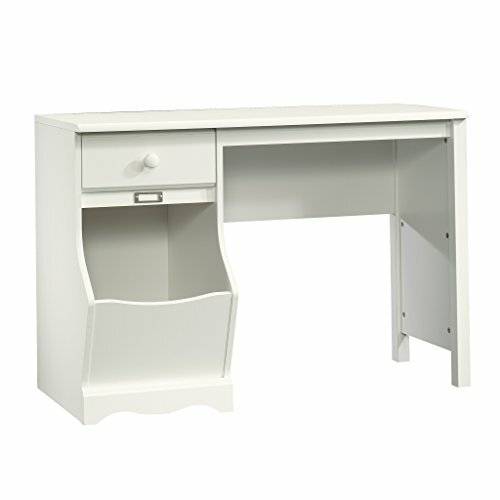 For a toddler desk, you’re going to want something extra durable that can withstand the beating of a small child. And can take the artistic abuse, as well. Because as sure as the child likes to color, she will like to color on that desk. And in most circumstances, you can’t correct an action she hasn’t yet taken, you’ll probably be cleaning off the paint, marker, crayons and more at least once. Plastics tend to wipe clean more easily and can withstand a child’s beating relatively well so you may want to consider this. Plastics reinforced by metal may be even more durable and some adjustments may add to the longevity, as well. Solid wood, especially that with a protective coating, can last your child well into her teens and even longer if maintained, but may be a bit more expensive. Aesthetics. Of course you’ll want a quality desk that will last, but keep in mind that the longer the desk lasts, the more decor it will have to match through it’s lifetime. So high quality desk that matches your tween daughter’s bubblegum pink room may not be the best choice for a desk that will last her into college. Likewise, a desk that gives her another chance for self expression is an opportunity you probably won’t want to pass up. Incline. Clearly an incline isn’t the kind of desk you’ll want to put a computer on top of, but for virtually any other use of a desk, the incline of a desk will improve your child’s comfort levels. It is a more ergonomic design to read and write on an incline, even if it’s just slight. For that reason, we highly recommend a desk that inclines for your toddlers and younger school-age children, before they begin to use a computer at their desk, at least. 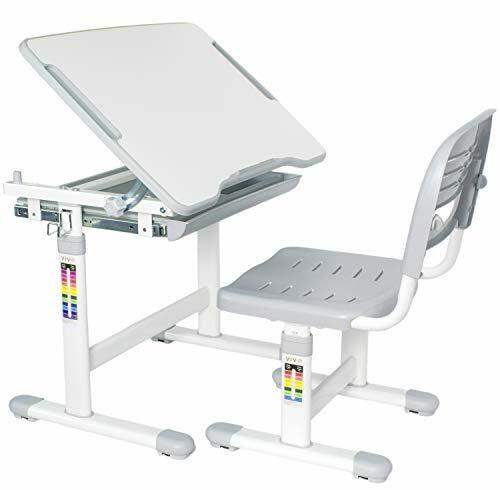 If your child will be operating a laptop, though, you may still want to pick up an adjustable incline desk. For desktops, a flat desk is necessary, but if you get your child a desk that will grow with them, then a desk that can incline or remain flat will be ideal for all scenarios and will go a long way for the longevity. Study desk vs. activity desk. A study desk is one that’s simple; it has a flat (or maybe slightly inclined) surface for its desktop but not a lot of it. There will be enough space for a few books, and writing supplies or a desktop and keyboard. (And you may even want to put the computer on the floor.) An activity desk will be essentially a table for your child to work on. There may be cubbies for specific tools, utensils, or coloring books. The activity desks are more geared to art and creativity and more often than not, you’ll find them best suited for your younger children. But not always, so you may not want to limit your child’s creativity by choosing a too “grown up” desk. Suitable for corner placement. A great way to save a bit of space is to put your child’s desk in the corner. Not only will it give your child more space to scoot his chair around more freely, but it will make use of the corner which is notoriously hard to use space. How big of a desk do I need for my child? Before you measure out the size of the desk, you’ll need to measure the size of the chair you’ll also purchase. If you’re buying a set, then that makes this step easy. Additionally, this won’t be a necessary step if you’re purchasing a desk for your toddler; there won’t be a large variety available or they’ll be adjustable to your child. But in case you’re not getting a set, then you’ll measure for a desk chair by sitting your child on a chair to find one that will allow her feet to touch the ground flatly and her knees to bend at 90 degrees. A little gap between the floor and her feet may work for room-to-grow purposes, but that won’t be the most comfortable position for her and you should consider a foot stool to mitigate that discomfort. Once you’ve measured the chair, the desk is easy: you’ll want the height of the desk to be eight inches above the seat of the chair. That takes care of the height but the width and depth won’t have a set number for you to rely on; you just have to go with what fits the space and your need. How much space do you need between a desk and a wall? The amount of space you need to allow between the desk and a wall is dependent on how many electronics you have that require being plugged in behind it. If you need to hook up several plugs, you’ll need a good 3″-4″ clearance from the wall to operate your power strip. There are several other factors you should consider with desk placement, as well. Will you want to be able to access these plug frequently? If so, you’ll need to make sure you have the space to do so. Does the desk have a full back or is there plenty of ventilation back there? Electronics do occasionally overheat and even if your electronics are efficient and shouldn’t overheat, you still want to prepare for the worst. Should the desk not have any electronics atop it, then feel free to push it as close to the wall as you’d like. You may want to consider a bumper of some kind along the desk touching the wall, though, because pushing a chair out from the desk in order to stand every time he gets up can rub the paint off a wall. If you plan on placing trashcans, filing cabinets or recycling bins under the desk, you can also pull the desk away from the wall and push the trashcan against it to maximize your foot room. How much space do you need behind a desk? The space required behind a desk for your chair will depend on how crowded you can handle your space, naturally. However, there is a general rule of comfort that says you’ll need a minimum of 23 inches away from the front of the desk for your chair. If your space requires people walk through the space, you may need to leave the same kind of space you’d leave for your dinning room chairs. That being the case, you’ll want between 36 and 48 inches of clearance from the front of the desk. How do I measure a corner desk? You’ll measure a corner desk just as you would a standard; simply with one more measurement. The measurements will likely read “left length by right length by depth.” This is so that you can see if one side is longer than the other. The depth is typically taken from the front to back but be careful to make sure; some manufacturers list depth as the widest part of the desktop and that means the corner. Some corner desks will give you several measurements, other just the three. If you have a corner desk that is an L shape with the appearance of two desks pushed together, the measuring will be easier. If the desk has a more rounded edge for you to sit at, then there will likely be more measurements provided and if it’s a simple desktop with essentially just the corners cut to fit flush in a corner, you’ll probably just have the length of the shortest side and the length of the widest listed for length. We looked at 20 other desks for kids. Even though they didn’t make our 5 best kids’ desks list, they’re the best of the rest and each is still a great option for your child. The information you’ll need to compare each one is included with the listing. This desk comes with a measuring chart directly on the leg that will tell you what height you should adjust it to based on your child’s height. This desk is made with high quality MDF board and a sturdy, solid steel frame for maximum safety. This desk will adjust high enough for your child to use it sitting or standing – which could be great for extended use. This desk includes space for a roll of paper for your creative kids and a cup holder to make sure they have space to store their pencils or a drink. With an included 3-level brightness lamp, your kid will protect his eyesight by preventing the struggle of working in the dark. This laminate wood desk is designed for a corner so that you won’t be wasting any space in your room design. This gorgeous desk has enough space for your little one to store anything he could need with plenty of drawers and shelves. This adorable shark desk is perfect for any sea or pirate themed room (or just a shark lover). This is the kind of classic desk you may be familiar with having during your school days and there is certainly something to be said for the efficiency of this design. This purple desk is perfect to match a room’s theme and its function is plenty impressive enough to please your little one. This desk may not have any customer reviews on Amazon yet, but the gorgeous design and functional use of space has us sold on its worth. This desk is compact enough to fit in most spaces and has a pull out keyboard drawer that allows your child to maximize her space. This easel will also convert into an art desk with very little complication, making it a perfect desk for your little artist. This chair and desk can convert into an armchair by sliding the desk, on its side, behind the chair. This converts from a desk to an art table and a ping-pong table with a cow theme and includes a matching stool. 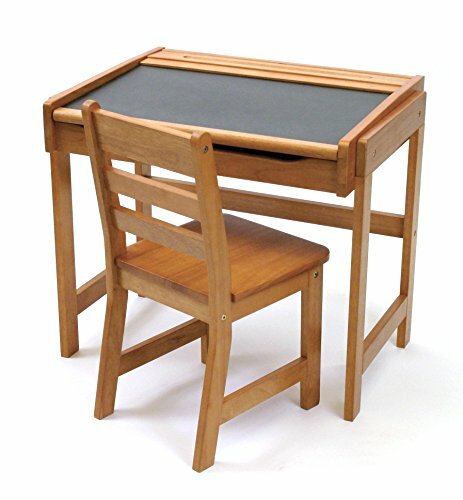 This art desk and chair are connected so you won’t have to worry about your little one sneaking a stool into another room to get into mischief. This slanted desktop lifts to reveal a storage bin perfect for your little one’s crafts and books. This chair is a durable one that your child can use as a foot stool (and maybe so can you) well after he outgrows it with its weight capacity of 150 pounds. You can use this as a desk or as simple storage when your little one outgrows it by lifting the desktop and pushing the side storage bins together and replacing the top. This desk is perfect for any kind of art project your little Picasso wants to try.